•	Within three months of account opening, make three direct deposits each of $500 or more. The checking accounts available for this offer are personal checking such as Key Express checking, Key Advantage Checking Account, Key Privilege Checking Account, and Key Privilege Select Checking Account. Business checking accoutns are Key Business Free Checking, Key Business Reward Checking, Key Business Checking, Key Business Money Market Checking, and Key Sweep Checking. There is of course some fine print. Per qualifying account, the limit is one gift per individual. Direct deposit transactions are limited to payroll, Social Security, government benefits and pension. Unfortunately, this promotion isn’t available to all. This will only cover individuals and businesses in the following areas: Eastern OH, Oregon, Seattle Cascades, Capital Region NY, Michigan, Maine, Cleveland, South Puget Sound, Rochester, Northwest OH and Central NY. Also, this offer is not available to persons who opened a Key Bank checking account in the past 12 months. Promotion is valid only until June 24, 2011. If everything looks good to you then cheers! You’re on your way to acquiring an iPod Touch of your own. Don’t miss out on this opportunity, you wouldn’t want to have to wait another year. iPods are a hot topic these days for banks to give away as part of their promotions. That is why we have made you a list of each bank giving Free iPods for signing up with them. 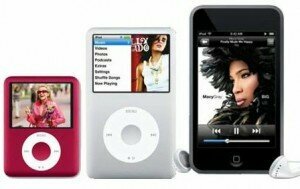 Whether it is for checking account promotions or for other banking promotions many banks are giving away iPods instead of money as incentive to sign up. The iPod Touch seems to be the most popular item to give away. We have seen iPod Shuffles and iPod Nanos given away by banks as well. It seems to me that iPod free giveaways would attracted some people much more than cash would. The reason, I believe, is the same reason some people would much rather open a gift on their birthday than get a card with cash. When banks pay you cash most of the time they simply deposit it into your account and that is the end of it. You never receive anything, you do not get to open anything and all in all it is kind of boring. But if they send you an iPod Touch you get it in the mail and you are excited to open it and start playing with it. It just seems more exciting and plus it is a great reminder to the consumer that the bank sent you this great gift. Personally I would rather receive an iPod. If I got $200 cash it would just get lost in the shuffle and end up being used to pay some bill or go out to dinner and a movie. Free iPod Touch with Bank of Greene County: For this particular promotion you need to sign up for direct deposit and use your debit card twice. Free iPod Shuffle with American Community Bank: Get a 2 GB or 4 GB iPod Shuffle with ACB. Not too difficult to get approved for. Different levels of checking accounts get different giveaways. KeyBank Free iPod Touch Promotion: (Expired) KeyBank is offering a free iPod Touch for those who open a new checking account from now until June 30th. Update: Even though this promotion has expired those that opened an account still have until 10-1-10 to meet all the requirements. Please let us know in the comments of more iPod or iPad bank giveaways. You can checkout our cash bank promotions on our checking account specials page. The Bank of Greene County is making it easy for you to get your hands on an Apple iPod Touch. Right now through September 30th Bank of Greene County has a checking account promotion which only requires two steps to qualify for your iPod Touch. Use the Visa® Check Card twice. Check out all the checking account promotions. The Bank of Greene County is FDIC insured and is located in New York. For more information on the iPod Checking Account Promotion visit here. From now until June 30th you can get a free iPod Touch with KeyBank. You must be a new customer and open a new account in order to qualify. Once the account is opened you must. Make one KeyBank Rewards debit card transaction. This promotion is only available in states that KeyBank is located: Alaska, Colorado, Connecticut, Idaho, Indiana, Kentucky, Maine, Michigan, New York, Ohio, Oregon, Utah, Vermont, and Washington. Once these requirements are made you will get your Free iPod Touch within 90 days. Click here (link removed due to promotion expiration) to get more information from KeyBank and to see the fine print. Check out all our checking account bonuses here.